Simple and Natural and No More Dry or Itchy Skin! Thousands of our customers testify that our skin moisturizers are effective and pleasant to use! And we've got you covered from head to toe! Find out which one works best for you! 100% Natural! Soothing and protective, our lip balm has been described as the best ever. See for yourself! Comes in a standard 7 ml oval lip balm tube. Any time of the year, your lips may need a little TLC. Whether they are chapped from the cold, or dried and cracked from the hot sun, this sugary lip scrub will do the trick and make you lips feel soft and pampered. With 100% natural ingredients, our beard balm softens your beard and soothes your skin. Comes in a small metal container with sliding lid that is easy to carry. Measurements are 79 mm x 35 mm x 10 mm or 3 1/8 " x 1 3/8" x 3/8". Moisturization for your beard and skin. On its own, water can dry skin and hair. You wouldn't just get in the shower and wet your hair and then dry it off but that is exactly what you do with your beard. Soften your beard hair, reduce skin flaking, and feel better. 95% natural. With our unique cologne added to our natural ingredient base formula, our beard balm softens your beard and soothes your skin. Comes in a small metal container with sliding lid that is easy to carry. Measurements are 79 mm x 35 mm x 10 mm or 3 1/8 " x 1 3/8" x 3/8". 95% natural. With chocolate flavour and peppermint essential oil added to our natural ingredient base formula, our beard balm softens your beard and soothes your skin. Comes in a small metal container with sliding lid that is easy to carry. Measurements are 79 mm x 35 mm x 10 mm or 3 1/8 " x 1 3/8" x 3/8". This mineral enriched masque draws out toxins and bacteria, leaving your face feeling smooth and soft. The list of benefits attributed to the use of Dead Sea Mud includes relief from psoriasis, eczema, acne and wrinkles, along with improved blood circulation, skin cleansing and regeneration, and stress relief. And you can avail yourself of all this without a trip to the Dead Sea! Our famous Dead Sea Mud infused with cucumber peel, camomile extract, and essential oils of sweet orange and ylang ylang. This mineral enriched masque draws out toxins and bacteria, leaving your face feeling smooth and soft. The list of benefits attributed to the use of Dead Sea Mud includes relief from psoriasis, eczema, acne and wrinkles, along with improved blood circulation, skin cleansing and regeneration, and stress relief. And you can avail yourself of all this without a trip to the Dead Sea! Our Super Soap Bundle includes our Best for Acne products! 100% Natural. Kit includes: Super Soap Hand Milled Facial Muffin 190 g, Dead Sea Mud 120 ml (60 ml shown in picture), Super Dot.Calm blemish stick 7 ml. Save $4.50 over items purchased separately. This exfoliating facial scrub removes dry, dead skin cells from the surface of your skin, revealing a fresher, smoother complexion. Cherry Triple Butter instantly became one of our top selling scents. Triple Butter is a blend of three exotic and well known butters: Mango Butter, Shea Butter, and Cocoa Butter. Our Lip Balm has been described as the best ever. And our Exotic Coconut is no exception. Enjoy! This fantastic serum contains only pure Pomegranate Seed Oil and pure Hemp Seed Oil. No additives, no fillers. Pomegranate Seed Oil contains the highest levels of polyphenols (powerful anti-oxidants which work primarily on the skin), regenerates skin cells, promotes the production of collagen and elastin. Hemp Seed Oil is made up of 80% Essential Fatty Acids, the highest amount of any plant, and not only provides an excellent moisture barrier but also increases the EFA levels in your skin resulting in a more youthful appearance. Youth AND wisdom, what could be better! Ideal age spot moisturizer. This fantastic serum contains only pure Pomegranate Seed Oil and Jojoba Oil combined with a blend of Lavender and Frankincense Essential Oils, which are particularly good for mature skin. No additives, no fillers. Pomegranate Seed Oil contains the highest levels of polyphenols (powerful anti-oxidants which work primarily on the skin), regenerates skin cells and promotes the production of collagen and elastin. Comes in an easy to apply roll-on vial. Dry skin can occur at any age. These oils will help rejuvinate your skin and retain your natural moisture. The wonderful shaving cake creates a luxurious lather. Made using age-old traditional cold-process soap making techniques, we add a high percentage of castor oil which creates a very rich, creamy lather. Additionally, we also add cosmetic clay which gives the lather extra "slip" and also works to purify your skin (think of a clay or mud mask). The shaving cake is beautifully contained in a pottery mug that was handcrafted locally here in Prince Edward Island, Canada by Island Stoneware. Finally, we include a quality wooden handle shaving brush. Shaving Cake Fragrance Options: Unscented (no scent), Bayberry (medium scent - a favourite with men), Peppermint & Eucalyptus (strong scent). Wooden Handle Options for Brush: Beech Wood (cream colour), Black Beech Wood (black), Acacia Wood (light brown). Pottery Shaving Mug Colour Options: Solid Blue, Solid Green, Cream with Blue Trim, Cream with Green Trim, Cream with Brown Trim, Brownish Red. Separately, the 3 items retail for $57.90 on our website. Pottery Shaving Mug Colour Options: Solid Blue, Solid Green, Cream with Blue Trim, Cream with Green Trim, Cream with Brown Trim. Helps heal dry skin and reduce fine lines and wrinkles. Our 100% Natural Peppermint and Eucalyptus Shaving Bar or Cake has proven very popular! This wonderful shaving bar or cake creates a luxurious lather. Made just like our cold-process soap, we have added a higher percentage of castor oil and some cosmetic clay for added "slip". This combination of Lavender, Rosewood, Patchouli and Lemon Essential Oils are very beneficial for your skin. This combination of Argan, Camellia, Marula and Abyssinian Carrier Oil are very hydrating and soothing for your skin. This floral water is a mixture of distilled water and fragrant essential oil. A versatile addition to any beauty routine, it can be used as a deodorant, facial spritzer, and for direct application to the skin, as a cooling agent, in saunas, in hair care applications, as a fragrance or for massage. Incredibly versatile and 100% Natural. This floral water is a mixture of distilled water and rose damascena. A versatile addition to any beauty routine, it can be used as a deodorant, facial spritzer, and for direct application to the skin, as a cooling agent, in saunas, in hair care applications, as a fragrance or for massage. Incredibly versatile and 100% Natural. Strawberry lovers enjoy! Softens and protects while gently moisturizing. This refreshing face and body scrub is almost as good as a day at the beach. Exfoliation gently removes dry, dead skin cells to leave fresher, younger, smoother skin. you! Made with 90% Organic Shea Butter! Super Popular and rightfully so - has a wonderful aroma! 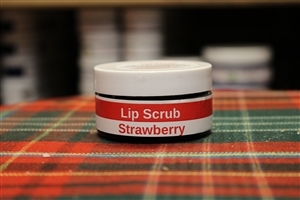 Moisturizes, softens and protects dry lips. 100% Natural! Wintergreen fresh and moisturizing! Softens and protects as well. Our Calendula Goat Milk Cream has a very delicate, light scent. Infused with Calendula which is thought to have healing properties and be very soothing. New in Summer 2016 and online by demand! Comes in a cute container with a pink top. This cream is very light in texture and soaks into your skin quickly. Note: This product is often made fresh when ordered. Please allow up to one extra week after your order has been placed. New in Summer 2016 and online by unprecedented demand! This is our highest end face cream. It soaks into your skin quickly and is very light in texture. A little goes a long way. This is our highest end face cream. It soaks into your skin quickly and is very light in texture. A little goes a long way. New in Summer 2016 and online by demand! Comes in a cute container with a pink top. This is our highest end face cream. It soaks into your skin quickly and is very light in texture. A little goes a long way. Comes in a cute container with a pink top. This is our highest end face cream. It soaks into your skin quickly and is very light in texture. A little goes a long way. Our French Vanilla lip balm is a Classic. Soothing and protective, our Lip Balm has been described as the best ever. See for yourself! Comes in a convenient and easy to roll up tube. Lavender is soothing for all skin types, and this Skin Toner is no exception. Delightful to use, the relaxing scent hearkens back to simpler times of old. Lavender is soothing for all skin types, and this aftershave is no exception. Pleasant to use, the relaxing scent hearkens back to when your Grandfather was a young man and lavender was all the rage in men's aftershave and cologne. If you skin is dry or sensitive, try this one. The added sandalwood fragrance has a distinctive soft, warm, smooth, creamy, and milky precious-wood scent. This product is 97% natural. Rich and fruity, this aroma hints at the Mango butter contained in our premium cream. Amazing in its ability to heal dry skin and reduce fine lines and wrinkles, it also treats eczema, dermatitis and psoriasis, itchy skin rashes and insect bites, provides UV protection and the list goes on. Natural Dot.Calm blemish stick is formulated with butters and oils specifically chosen for their abilities to nourish your skin and heal acne and pimples. Completely unscented for sensitive skin. Calm your dots with Dot.Calm! A special blend of butters and oils that work together to effectively moisturize very dry skin! Naturally unscented - no added fragrance or essential oils. Our Super size container delivers Super savings and makes application quick and easy!